If you are wondering to build your online portfolio/resume website this is the perfect template for you. Oniha is a Super Clean and Super professional personal portfolio template.If you are a Designer, freelancer, marketer its only for you. 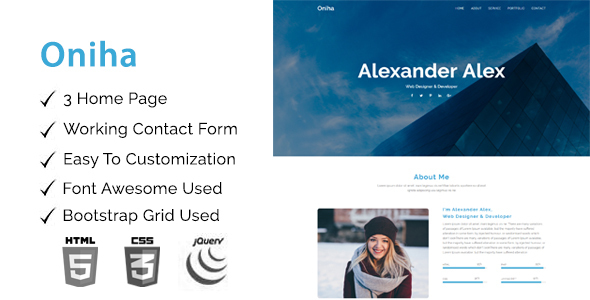 Oniha template build on Bootstrap Latest version.. You can use it for your personal resume, CV or your portfolio Onihatemplate is written in valid and clean HTML5 & CSS3 code. It’s Super easy to customize and also well documented so it’ll suit your needs.